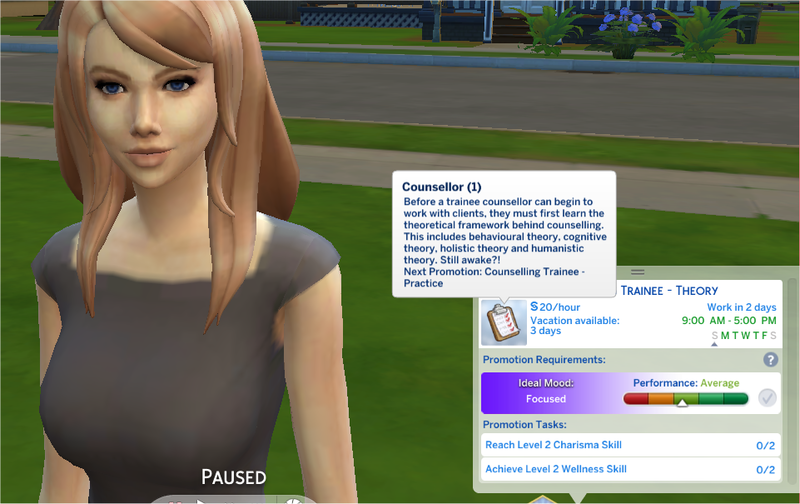 This career allows your sims to become counsellors and choose whether to specialise with adults or children. It is a rabbit hole career, no chance cards as of yet. Spa day is required if you want to be promoted as the career focuses heavily on the Wellness skill, as well as base game Charisma. 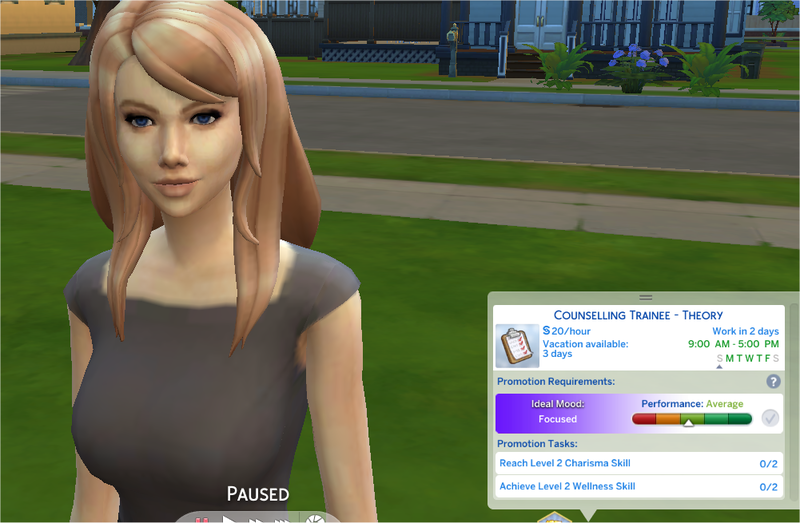 The Career has two tracks, once you reach promotion from level 4, you can pick what sort of counselling your sim will specialise in. 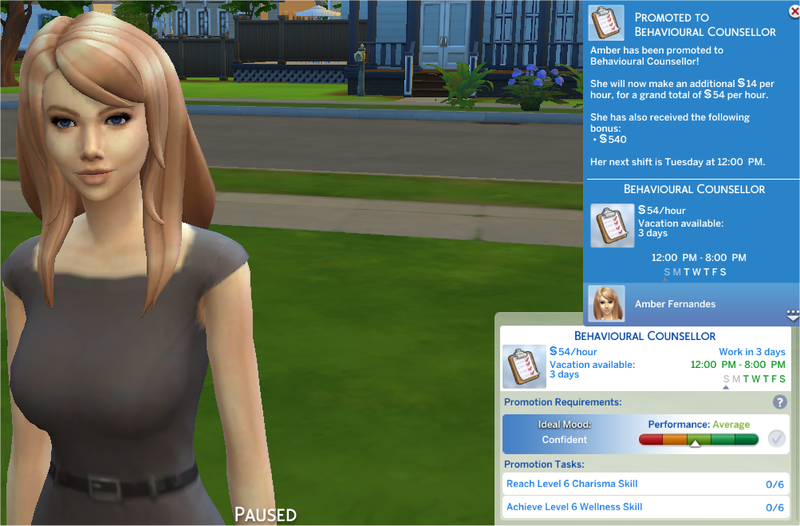 Description: Make a career for yourself supporting your fellow sims throughout the various problems that arise through day to day life. You will play an important role in helping your clients find their way in life and get back on a happier path. Before a trainee counsellor can begin to work with clients, they must first learn the theoretical framework behind counselling. This includes behavioural theory, cognitive theory, holistic theory and humanistic theory. Still awake?! Having learnt the theory, the next step is to sit in on counselling sessions and learn from your peers! Lots of note taking and learning how to listen and respond in a constructive manner is ahead! With counselling theory and practice now behind you, your peers at work trust you to take over a few of their more easier clients without supervision though they will still review your sessions and provide feedback. With the groundwork of counselling now completed, you can take on your own clients and begin to work as a recognized counsellor without any supervision or feedback. Specialising in adult counselling is very rewarding. Choosing this counsellor path will allow you to gain experience in marriage, addictions and trauma counselling. Dealing with marital problems, separation and divorce is all a part of being a marriage counsellor. You will provide invaluable support to your clients experiencing these issues. Unfortunately, troubled individuals can turn to various substances and behaviours to help them cope with life. As an addictions counsellor, you will help those trying to cope with alcohol, drugs, gambling and other addictive vices. Your clients now need your guidance in dealing with a variety of traumatic issues, including bereavement, domestic violence, post traumatic stress disorder, terminal illness and more. Having worked your way up the ladder and dealt with a variety of different clients and scenarios, you are now adept at counselling and can help almost all clients to the point of recovery. You've made it to the very top! Every day you change the lives of others around you, there is no situation or client that you can't handle. You are now the most sought after counsellor in the world. Congratulations! Choosing to specialise in counselling children is not a choice that should be made lightly! You will support children in behavioural issues, bullying issues and help them cope with depression and anxiety. Children are our future generation and vulnerable, it is very rewarding to be in a position to help them through the journey of childhood to adulthood. Having chosen to specialise with children, you will now work with children suffering from ADHD, Conduct Disorder and Oppositional Definant Disorder. Your clients now need your support to cope with bullying. You will help them talk through their feelings and guide them in building self esteem. Your clients now need your support to cope with depression and anxiety. Children can find school, home life and social life stressful at times, due to a wide variety of situations, you will help them identify what is causing their depression and anxiety and talk through it. Having worked your way up the ladder and dealt with a variety of different clients and scenarios, you are now adept at counselling and can help almost all children to the point of recovery. You've made it to the very top! Every day you change the lives of children around you, there is no situation or child that you can't handle. You are now the most sought after child counsellor in the world. Congratulations!